Since I left school in Norris Arm, I have been having some fun adventures. 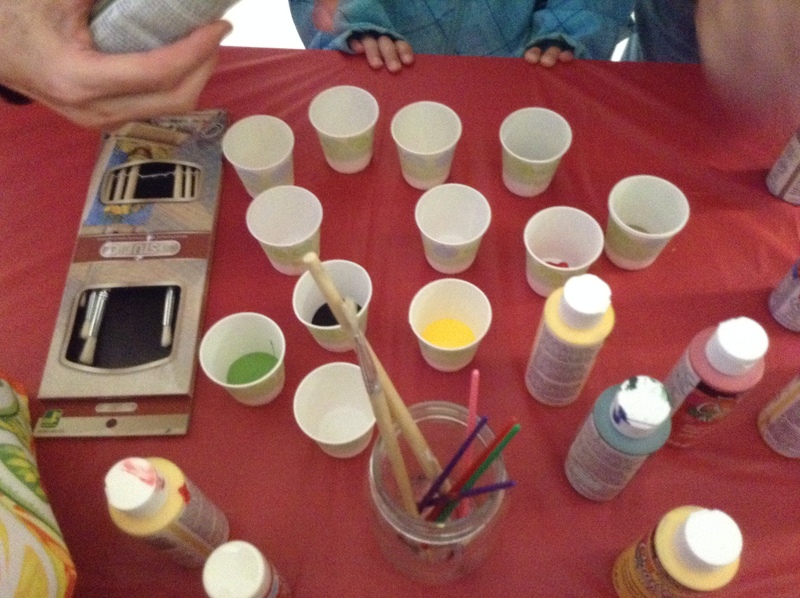 I went to Gander and met a teacher there who was happy to take me with her on the weekend. 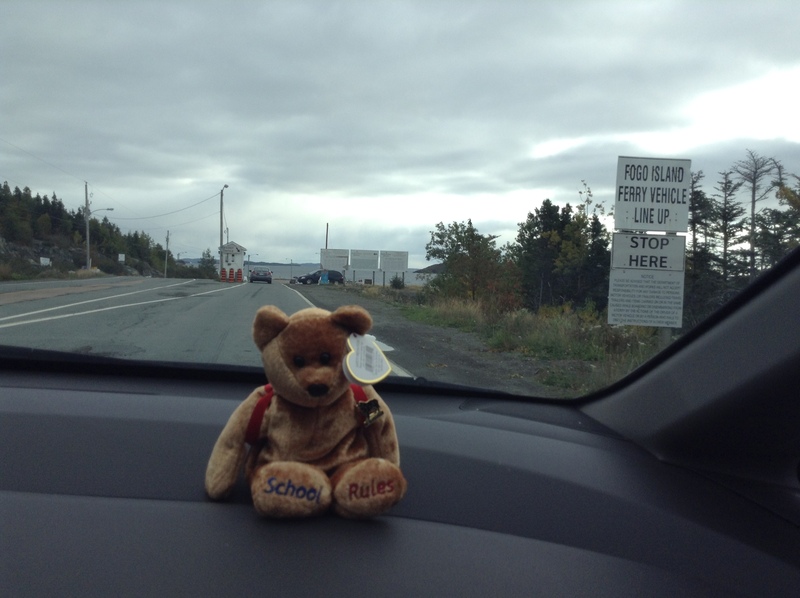 She was not spending the weekend in Gander so we left on Friday October 9 and went for a drive. Take your maps and find Gander. Now look for a road with the number 330 on it. 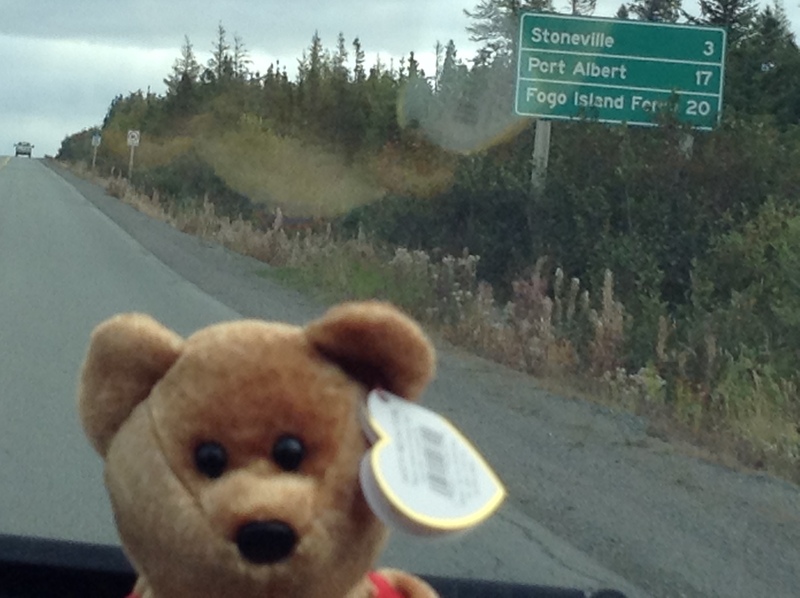 We went north on this road and out of the Town of Gander. It was a beautiful day and I was very excited to go for a drive. I saw lots of trees with lovely fall colours in the leaves. We drove to a place where we had to turn on to Route 331 and we went over a long bridge or causeway. 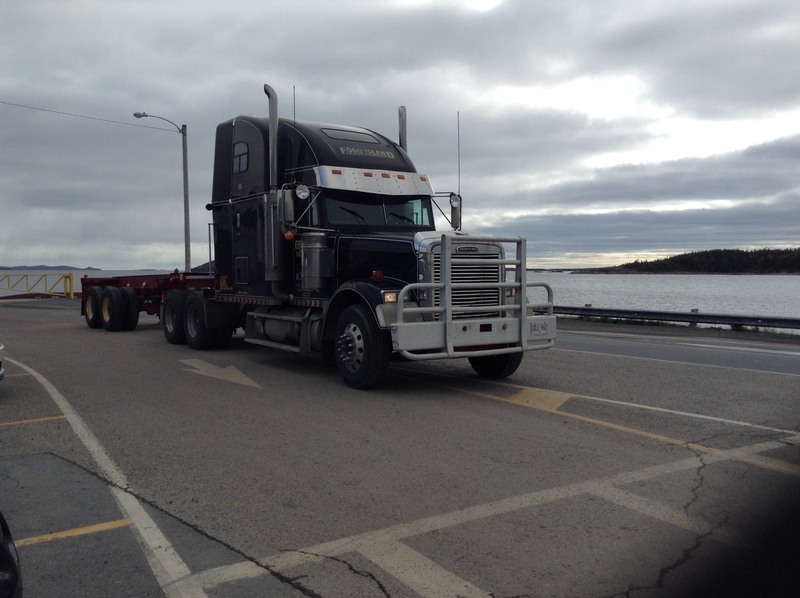 The causeway was built so people could cross the Gander River without having to take a boat. In Gander Bay I saw lots of small wooden boats.They make a special boat called the Gander River Boat. It is great for hunters to use along the river. We drove again along the side of the Gander River and finally we turned again on to Route 335 and headed to the end of that road. I was so excited! We were going to go on a big boat! 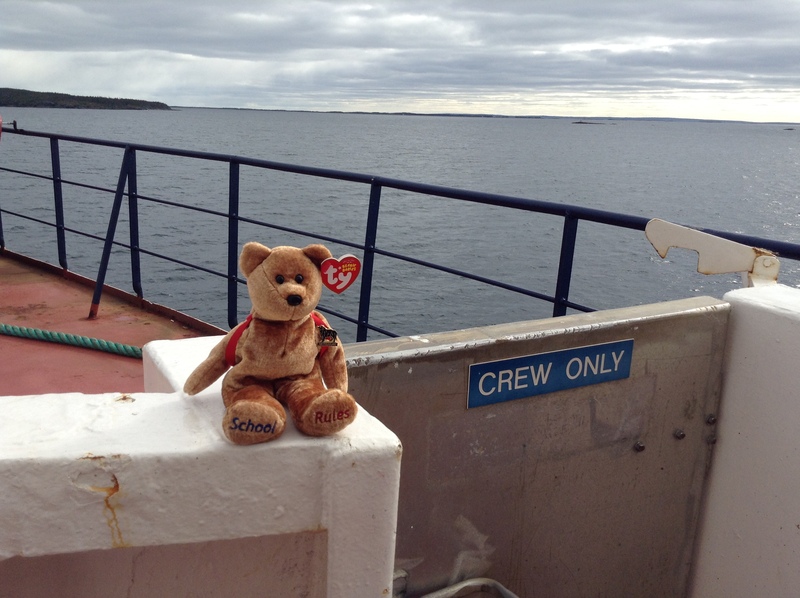 The boat is a ferry that takes vehicles and passengers to and from Fogo and Change Islands. There were even transport trucks on the boat and lots of cars and trucks too. 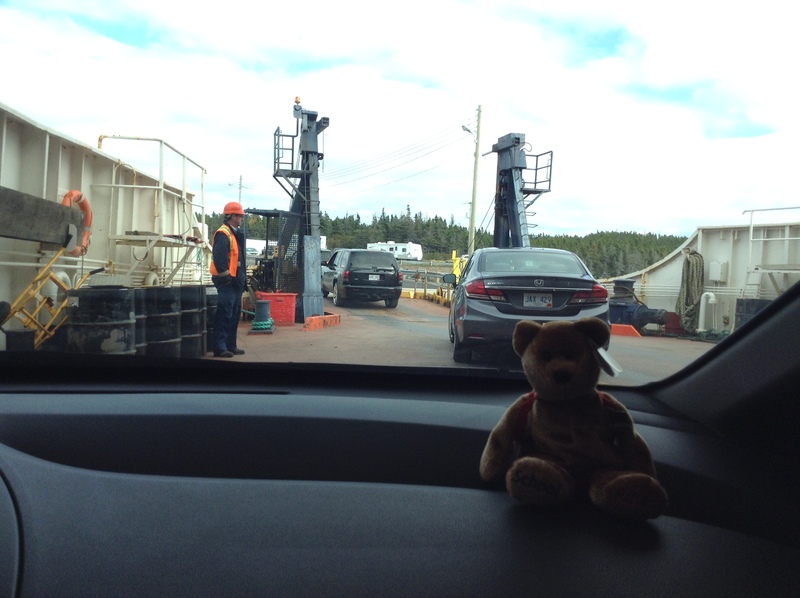 The ferry was so big we could get out of our cars and go upstairs to the second level of the ferry. There were a lot of people on the ferry. I met people who were here for their holidays from Saskatchewan. That is a long way from Newfoundland. They were very excited to be exploring Fogo Island and we watched a video on the ferry that told us a bit about Fogo Island and the communities there. There are a lot of communities on Fogo Island. Some people think there is only one community. 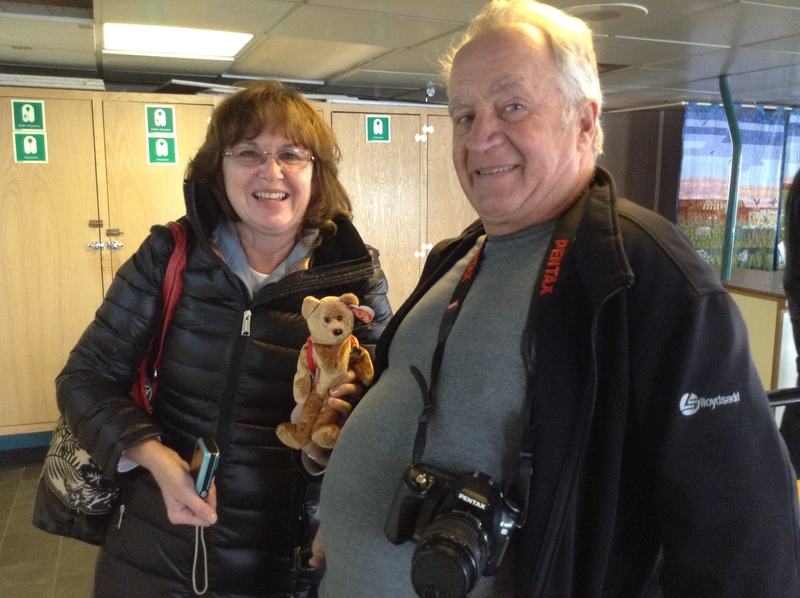 The people on the ferry were very nice. 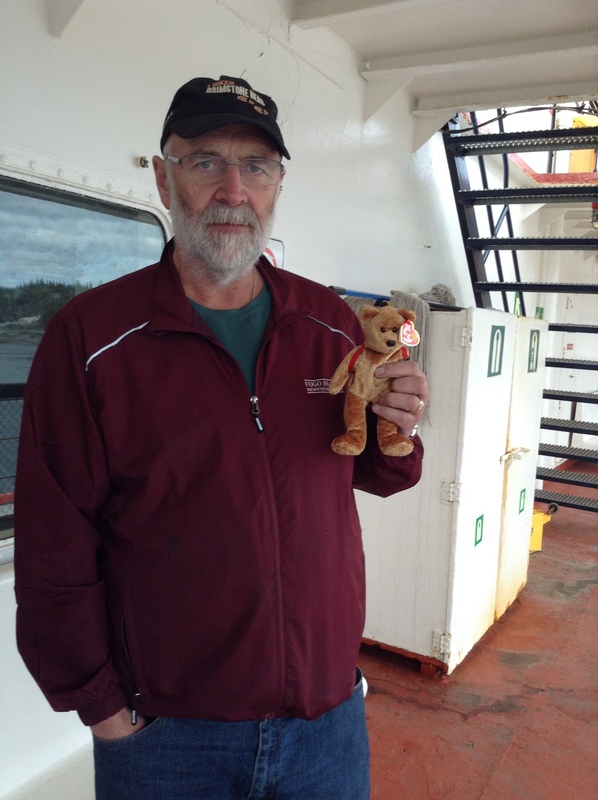 I even met the Mayor of Fogo Island, Mr. Andrew Shea. 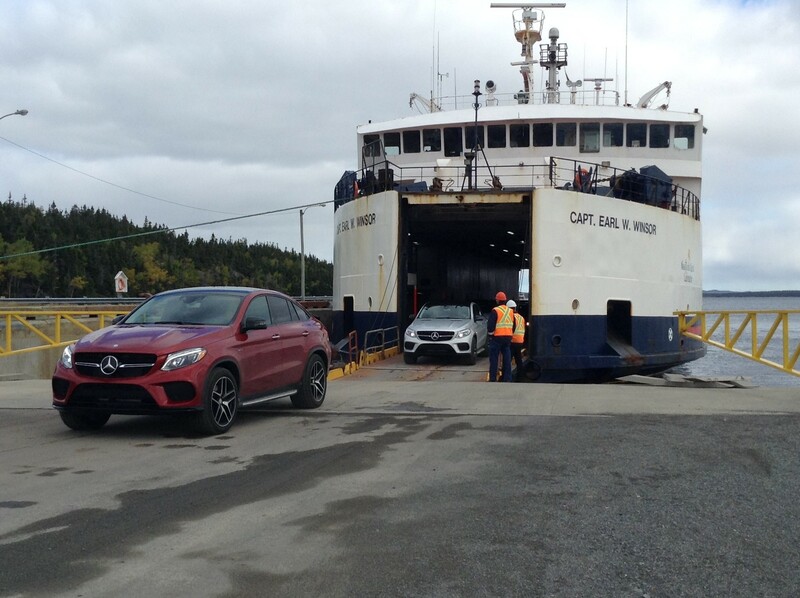 Many people work on the ferry to make sure it runs properly and that cars and people get on and off the boat safely. The ferry workers tie the boat with huge ropes when she docks so the boat will stay still while cars go on and off the ramp. 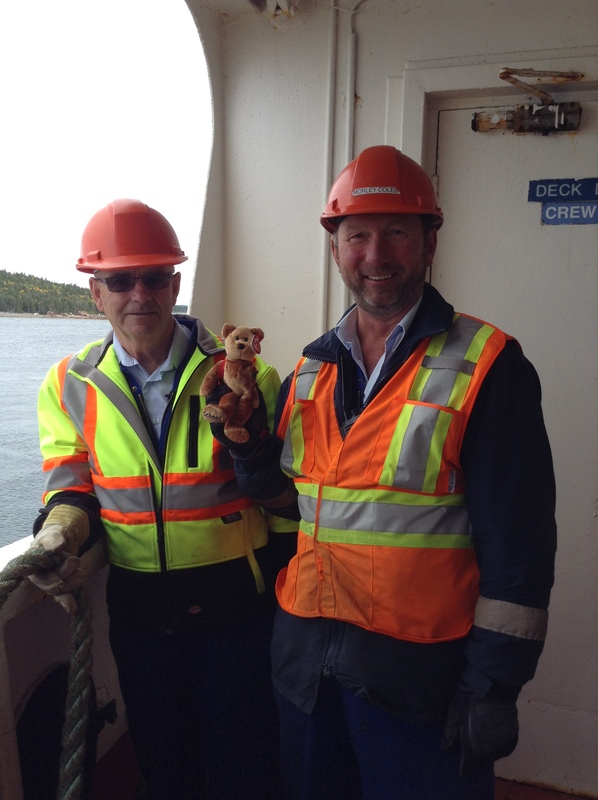 The workers were very helpful and showed me around the vessel. 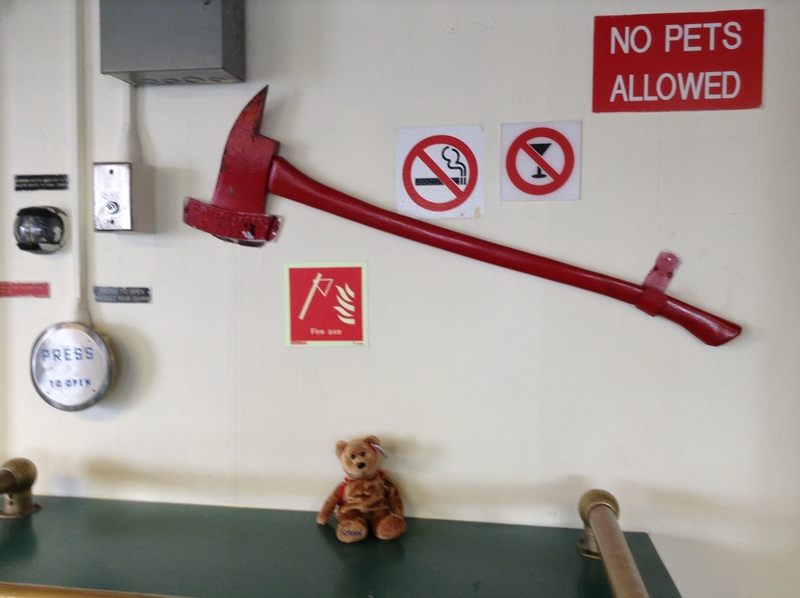 I was worried about the No Pets sign but they said if I was a tourist, it was okay. After we left Change Islands we finally got to Man O’War Cove on Fogo Island. 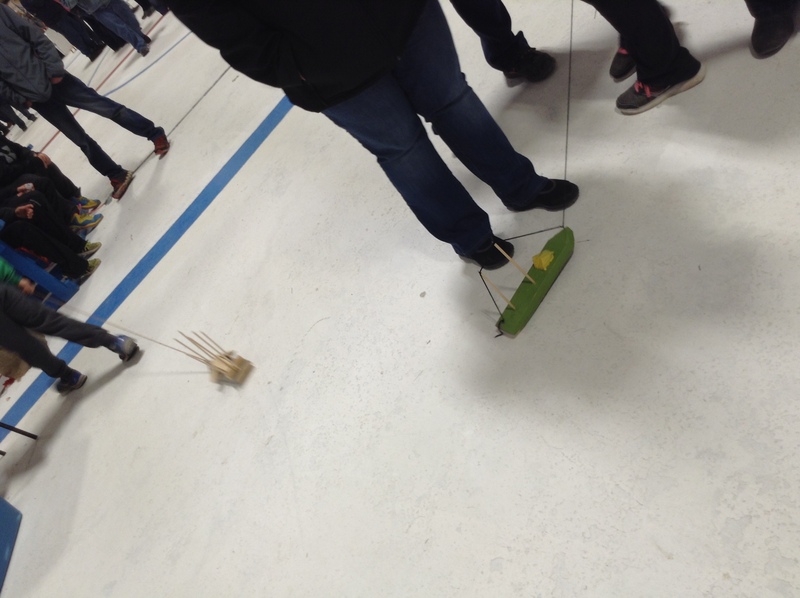 All of the cars had to drive off one behind the other, just like in school when we line up! That was a surprise. 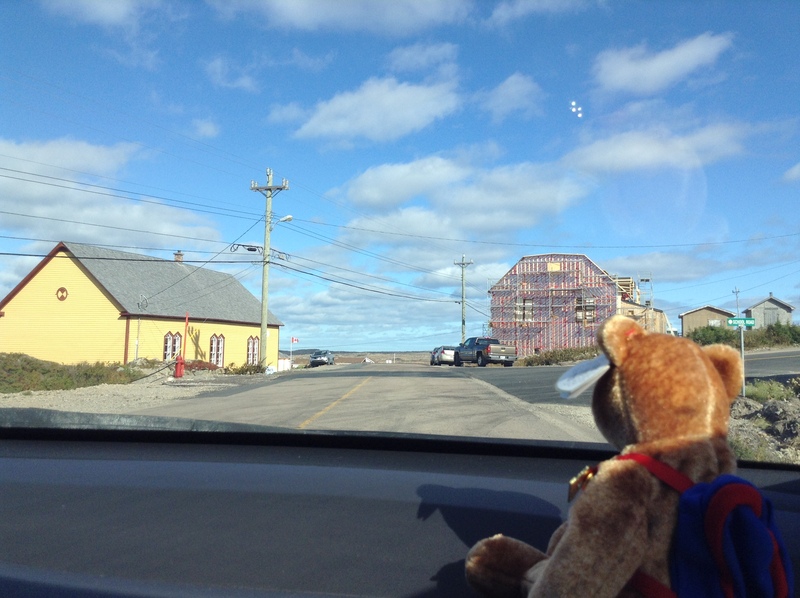 When we got to Fogo Island we went for a drive to Island Harbour. We saw a big old house that was being restored. The house was empty for a long time but now it was being fixed up and looking very nice. It was so nice to see so much water all around us. Deep Bay is a small outport on Fogo Island. We stopped there to take some pictures and enjoy the view. There are walking trails and great places to pick berries near Deep Bay. I didn’t see any other bears but someone told me there was one polar bear there this winter. He did not stay long, he just went back out on the ice looking for some food. Our next destination was Joe Batt’s Arm. We drove through Shoal Bay and past Barr’d Island. There were lots of big wooden buildings in Joe Batt’s Arm. Some men were working on the biggest building to make it look new again. We had had such a busy day that I forgot how hungry I was getting. 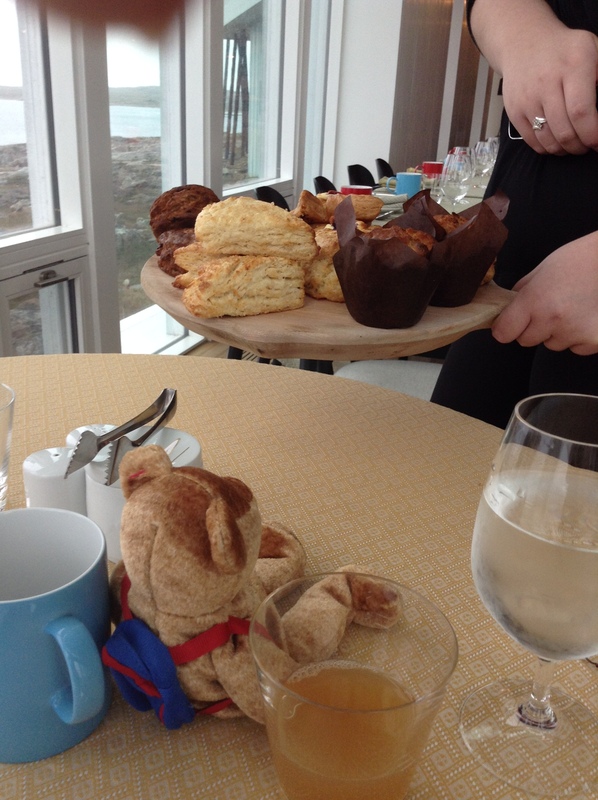 It was almost supper time so we went to our room at the Fogo Island Inn. I’m glad I brought my best back pack. It was very nice there. 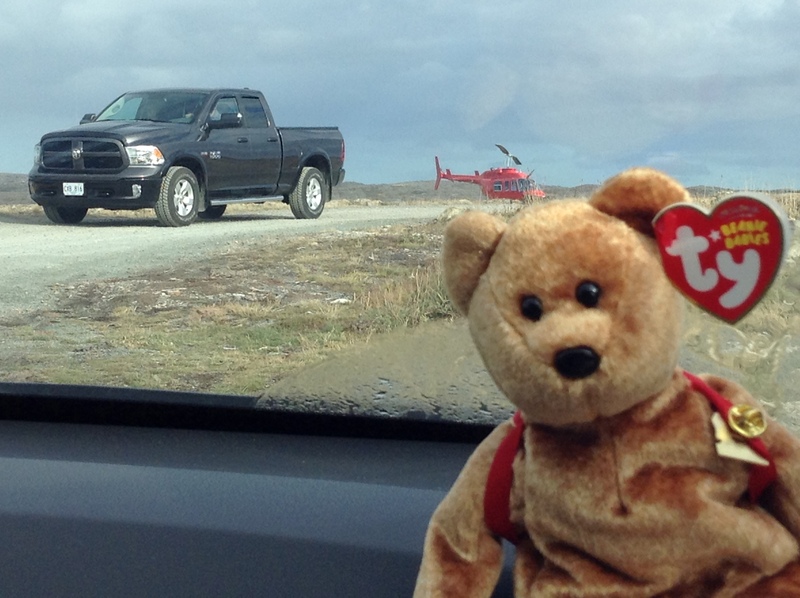 We traveled to Fogo Island in a car and on the ferry but some people fly in by helicopter. There are lots of ways to travel around Newfoundland. 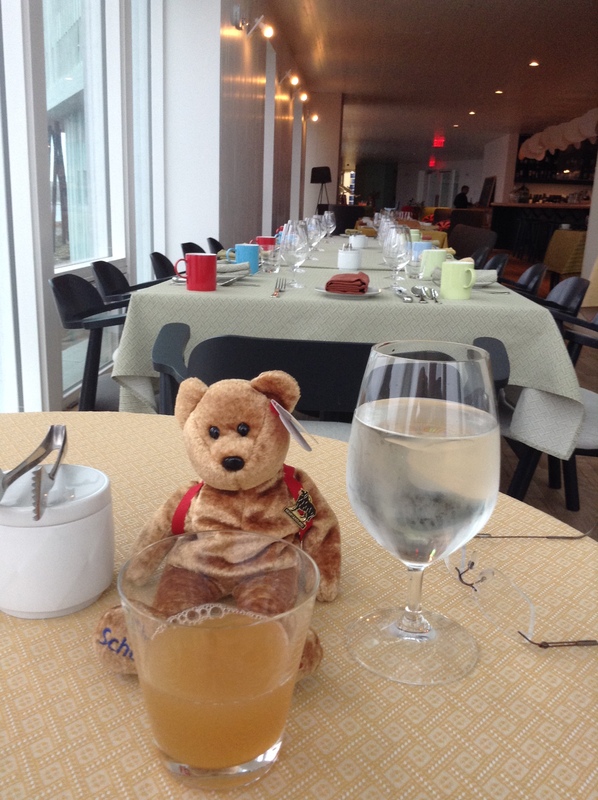 When we went to our room, I could not believe that they had made us a lunch. Homemade butter and homemade bread with molasses. I like molasses as much as Winnie the Pooh likes Hunny! The Fogo Island Inn is a big hotel with a dining room, a theatre, a library and 29 bedrooms for guests. There are a lot of people who work there. Over 80 people have jobs at the Inn. 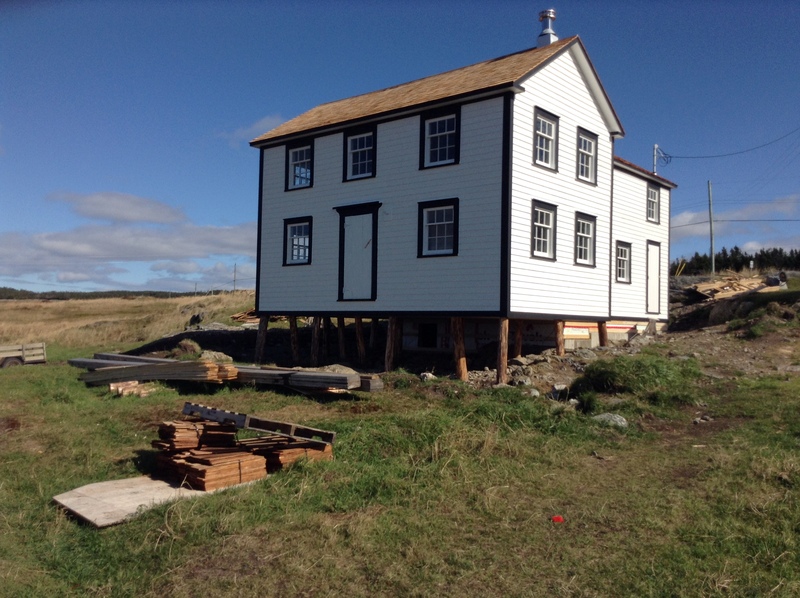 They keep the rooms nice and clean, prepare great food and even take guests on field trips around Fogo Island. This building had legs like a fishing stage. I was too tired to go anywhere on Friday but we went to a festival on Saturday. The Fogo Island Partridgeberry Harvest Festival happens every year at Thanksgiving. There were many booths and activities at the Iceberg Arena. 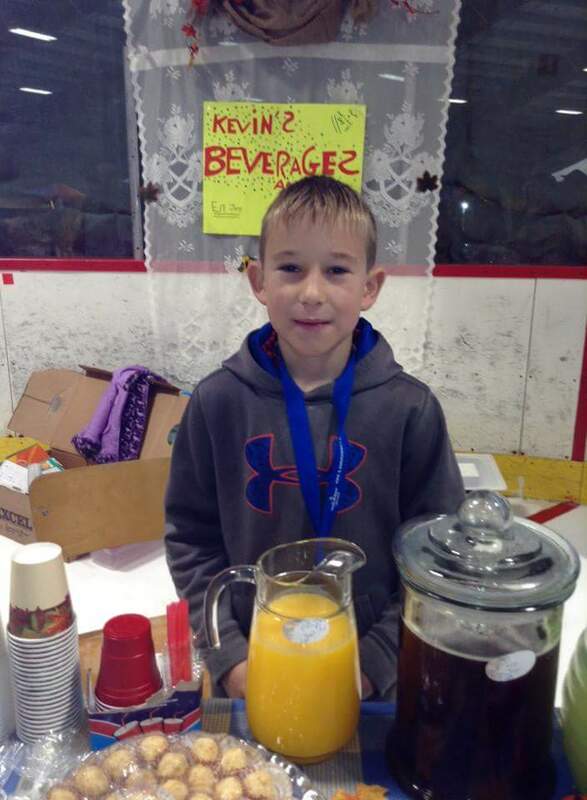 There was even a boy with a booth. He was working very hard. 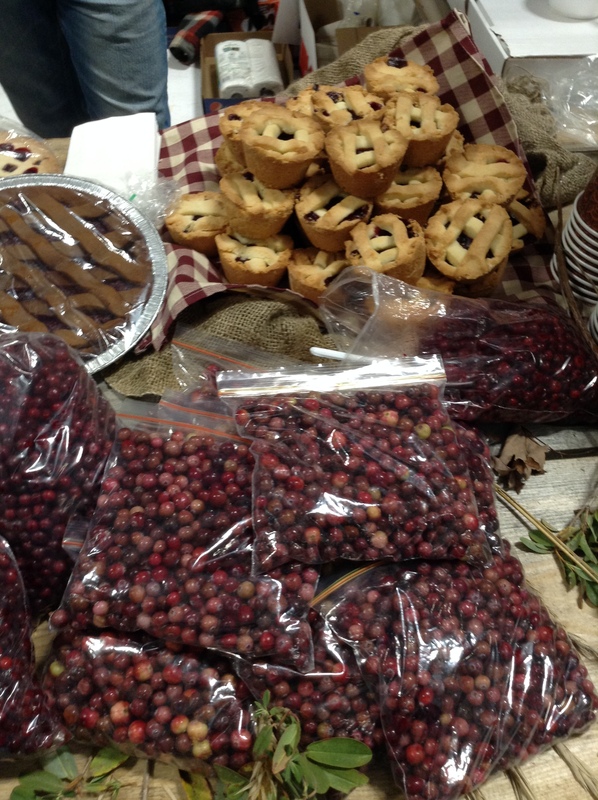 Partridgeberries and partridgeberry tarts from Chester’s One Stop. They have contests for the best vegetables and the best crafts. There is even a contest for the best recipes with partridgeberries. 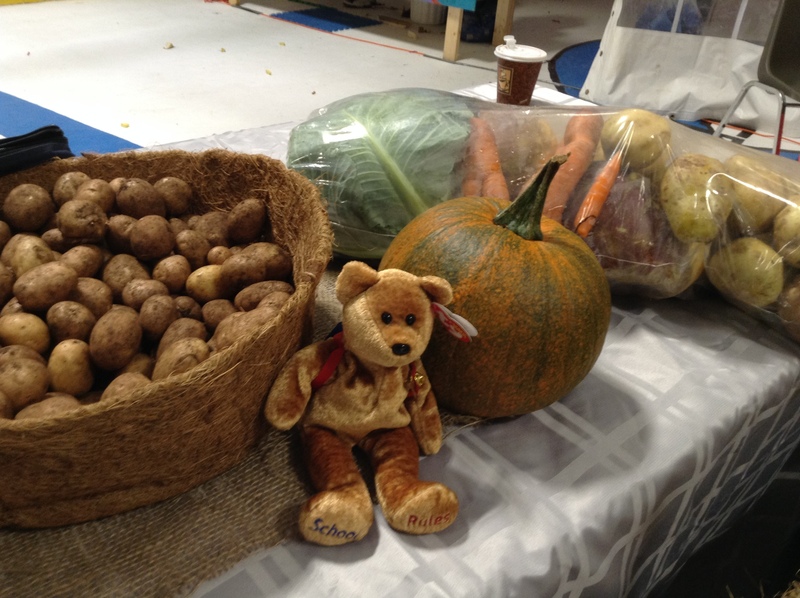 There are a lot of vegetables grown on Fogo Island. These vegetables were for sale. The Chefs from the Fogo Island Inn had a booth at the festival too. 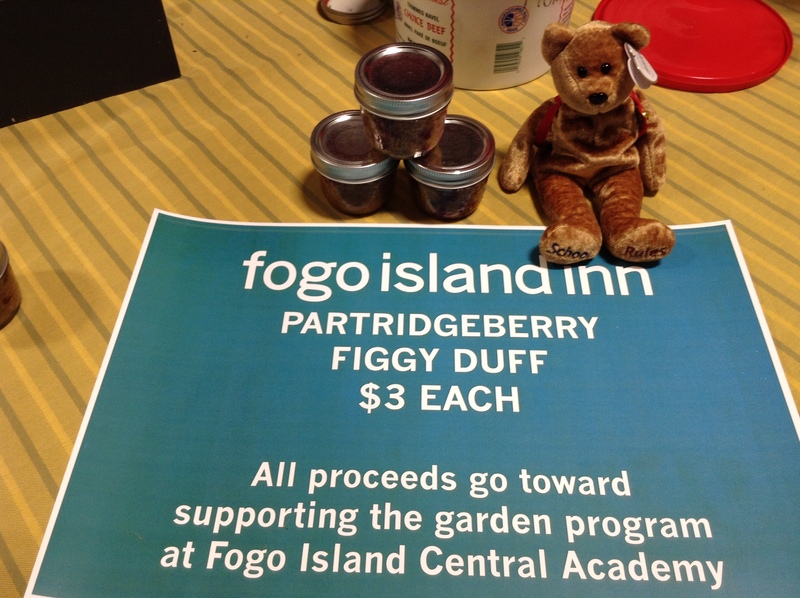 They made Partridgeberry Figgy Duff and sold it to visitors as a fund raiser for the school on Fogo Island. It was delicious! There were a lot of kids at the festival. 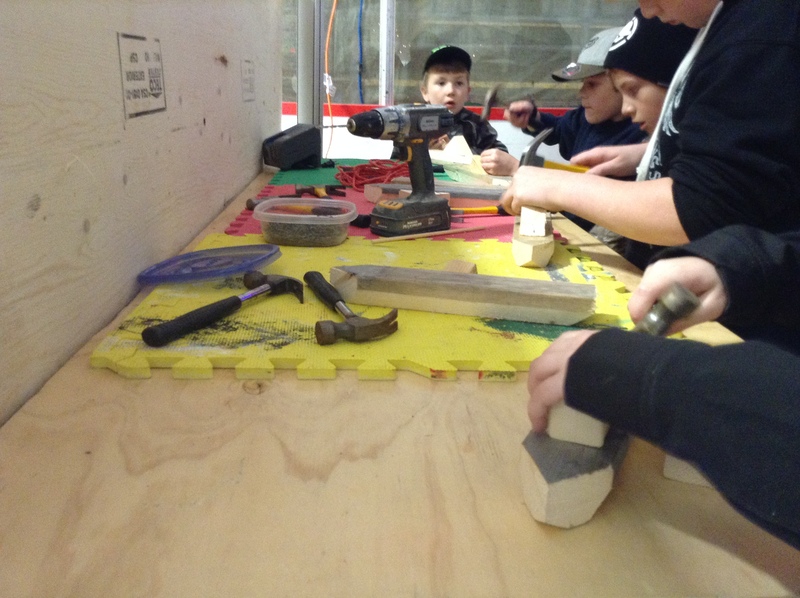 Some of them made wooden boats in one of the booths. They nailed them together and painted them and pulled them around on strings because there was not water in the stadium. 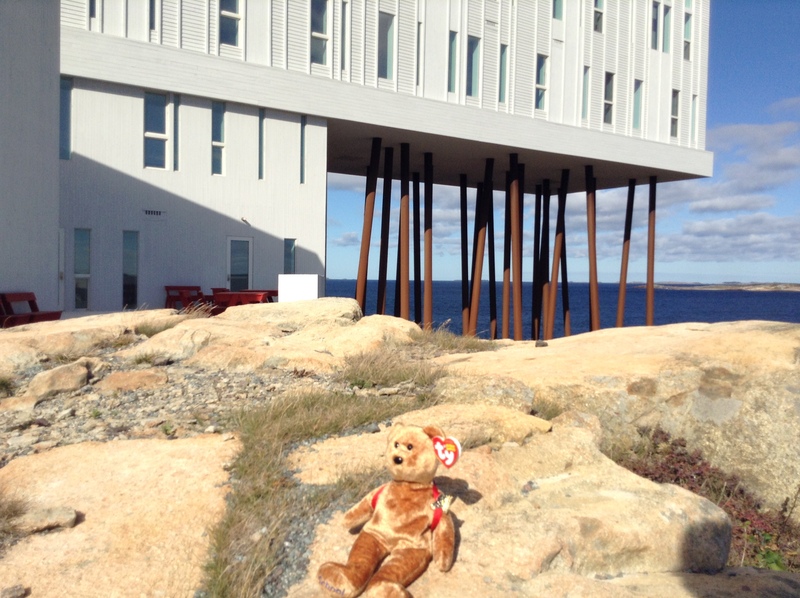 There was another special event on Fogo Island on the Thanksgiving weekend. Back at the Inn there was a group of visiting chefs who were preparing a special meal for Saturday night. At the Fogo Island Central Academy, they have a school garden. The chefs helped the students harvest two hundred pounds of vegetables from the gardens on Friday. On Saturday, I met some of the Chefs. 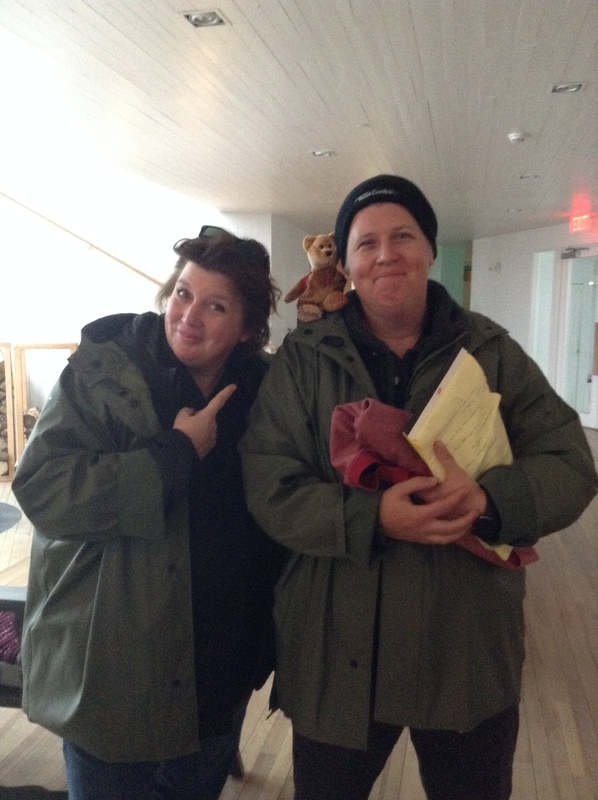 Chefs Lynn Crawford and Chef Lora Kirk came from their restaurant in Toronto just go cook at the Fogo Island Inn for the weekend. Their restaurant is called Ruby Watchoo. I love that name! The chefs cooked local food. They cooked pork, caribou, lamb and moose. They also cooked crab, halibut and scallops. They even picked mushrooms on Fogo Island and served them for supper. You have to be an expert to pick mushrooms and the chefs knew exactly which mushrooms to pick and which ones to leave alone. I was so full I had to lay in the middle of the bed and I felt like I was as big as the bed. I guess I wasn’t when I look at the picture. 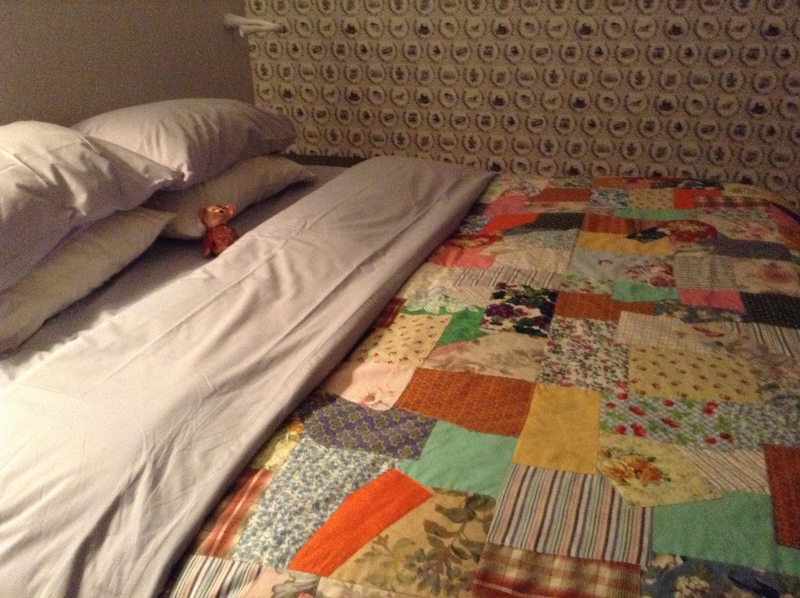 Spread out in the middle of the bed under a Fogo Island Quilt. I was still really full in the morning. I only had room for a muffin and a glass of apple cider. Home made juice at the Fogo Island Inn. 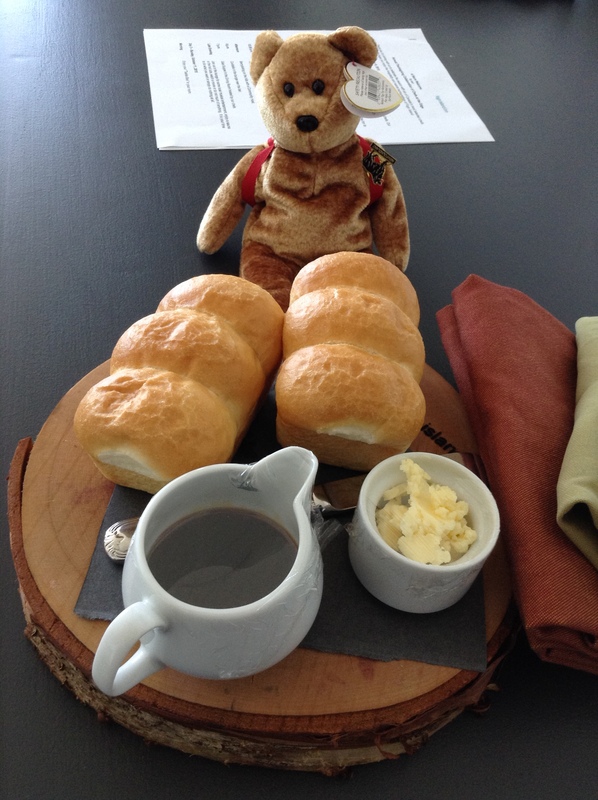 Bear sized muffins and pastries. In the afternoon, there were special visitors who came to the Inn. 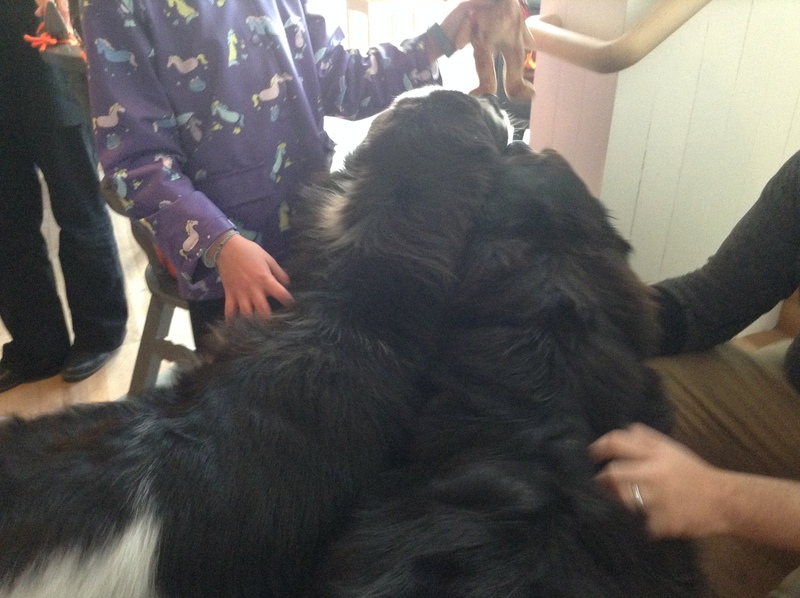 They are named Make and Break and they are Newfoundland dogs. They were HUGE. I think I still smelled like muffin because they were VERY interesting in me. I was nervous but one of the girls staying at the Inn helped me stay safe and dry. Newfoundland dogs are real droolers. Those are really big dogs! 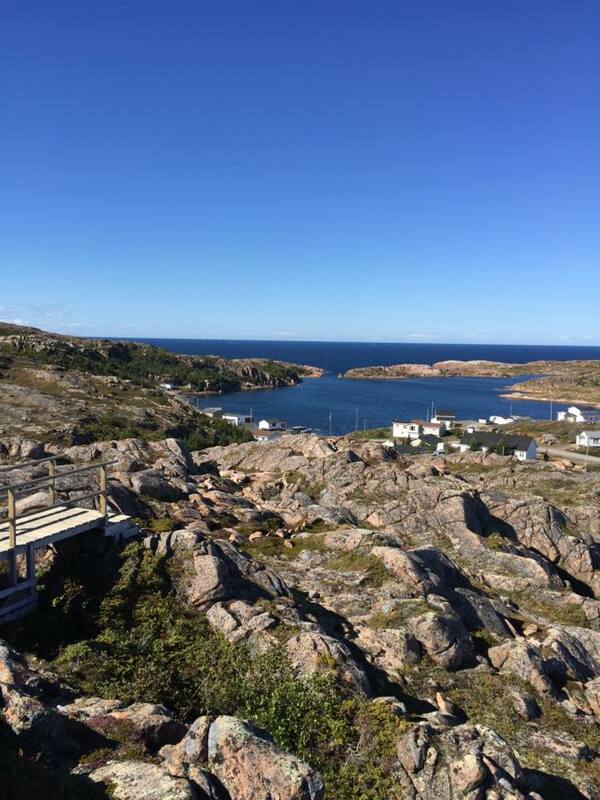 I had a great Thanksgiving weekend on Fogo Island. I met a lot of people and saw a lot of interesting booths at the festival. I even tasted some new foods and they were delicious. We went back to the festival and I met a nice lady named Madeline. She lives in Buchans and said I could go for a visit with her. I knew we would have fun because she was very friendly. I’m sorry it took so long to write, boys and girls. I hope you are having a good time at school and I look forward to telling you about more of my travels in my journal.